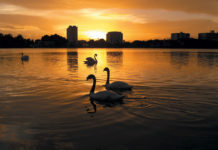 Central Florida’s economic engine, Orlando, became the first-ever in the U.S. to welcome over 60 million visitors last year, and in 2015, tourists will find more reasons to visit Orlando now that new attractions are on the horizon. 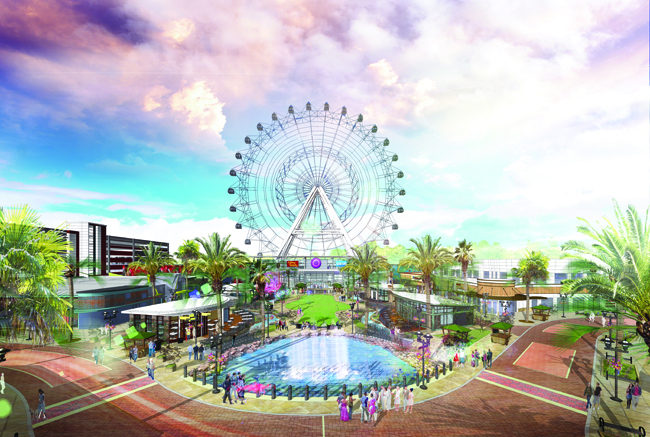 Orlando is welcoming three new attractions from operator Merlin Entertainments—and all three are opening in early May and are part of the new $200 million entertainmnet complex, I-Drive 360—The Orlando Eye, Madame Tussauds Orlando and the SEA LIFE Orlando Aquarium. The Orlando Eye is a colossal observation wheel that on a clear day will give riders a bird’s-eye view of Kennedy Space Center and the east coast. The wheel features 30 air-conditioned capsules with LED lighting and Bose audio speakers. Riders can enjoy a 20-minute ride on The Orlando Eye and a pre-flight 4D experience where they can watch a 3D film with in-theater effects that feature fireworks, wind, scents and lighting. Tickets are $18 pp. For those seeking a once-in-a-lifetime chance to meet their favorite celebrities, in wax form, of course, there is the new Madame Tussauds Orlando. From TV to film, sports and music, this wax museum features celebs from today and yesteryear; the list includes Brad Pitt, Taylor Swift, Michael Jackson, Steve Jobs, Albert Einstein, President Barak Obama, and more. Online ticket prices are $18 pp. The 25,000-sq.-ft. SEA LIFE Orlando Aquarium, meanwhile, features different habitats from the world’s vast oceans such as the Atlantic and the Indian, as well as Florida’s freshwater lakes and ponds. Tickets are $25 for adults, $20 for kids, and children under 3 are free. SeaWorld Orlando welcomed its newest show in mid-April, the Clyde and Seamore’s Sea Lion High. The show takes place in an aquatic-themed high school with the stars of the show, Clyde and Seamore. The dynamic sea lion duo are both nominated to win scholarships to Ocean University, but to do so they must enter crash courses in science, dance and gym—the show features an all-new set, storyline, songs and script. New this month to the LEGOLAND Florida Resort is the LEGOLAND Hotel, as well as Heartlake City, a new expansion to the park. The LEGOLAND Hotel features 152-themed guestrooms with four different themes—Pirate, Adventure, Kingdom, or LEGO Friends. The hotel offers nightly children’s entertainment and gives guests early access to select LEGOLAND rides and attractions before the park opens to the public. 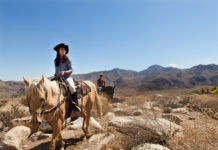 At Heartlake City, visitors will enjoy a horse-themed disc coaster called Mia’s Riding Adventure, and an interactive show, Friends to the Rescue, as well as new shops inside Heartlake Mall. Crayola Cafe. Ticket prices for adults and kids are $19.99; kids under 2 are free. Walt Disney World Resort is in the process of a multi-year transformation of its popular Downtown Disney to Disney Springs. The new expansion is doubling the number of shops, restaurants and other venues from the current 70 to more than 150. Disney Springs will open in phases with a completion date set for 2016. Although not arriving until 2017, construction has begun for the newest land at Disney’s Animal Kingdom based on the hugely successful film, “Avatar.” Known as the largest expansion in the history of Animal Kingdom, the new Avatar land will feature floating mountains, bioluminescent rainforests, after-dark entertainment, and a Banshee flying attraction. On the accommodations side, Disney has welcomed a re-imagined Disney’s Polynesian Village Resort. The resort, which is still undergoing some renovations, features 360 Deluxe Studio Villas and 20 two-bedroom, overwater bungalows as part of Disney’s Polynesian Villas & Bungalows, the newest Disney Vacation Club Resort. The bungalows are able to sleep up to eight guests and include two full bathrooms, a kitchen, a dining and living room, plus a washer and dryer. There are also 484 traditional hotel rooms in a village of 2-and 3-story longhouses. The 650-guestroom Hard Rock Hotel at Universal Orlando has debuted new guestrooms inspired by the “essence of rock” and featuring a new look that includes a mix of retro-inspired shapes, patterns and colors paired with sleek-lined details. Interactive elements include a wall mirror that features the heights of famous musicians, thus offering guests the chance to see which celebrity is their same height.